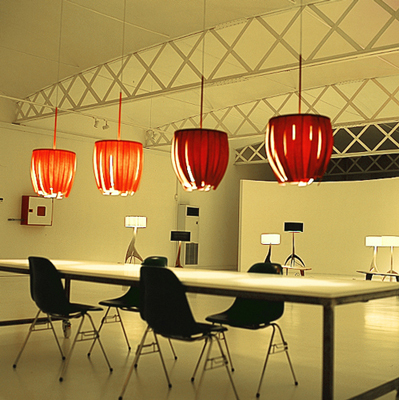 Barcelona in the 80`s he co-founded the group P-30 where he created the collection “ATMOSFERA”. Which consisted of objects of furniture and lighting, followed by a beautiful collection of models for window displays which captured the attention of important designers of that period. His evolution continued with EEM Studio where he specialized in "back-drops" for cinema and publicity set designs. With very much demanded by many national and international producers of commercials, in the 90`s he continued experimenting in design. Creating objects like the “ODA” collection which suggested organic forms inspired by nature that has developed thru the years into the unique style of Miralbell. One of his new projects, known as “SOUTH SEAS",presented in 2002 and present commercilized, incorporates elements of illumination and furniture, shows his interest of transforming wood into moldable material, without resistant to the author`s imagination.